Light: Sharing in a great celebration. Sharing in a communal sense of achievement and success. Preparing for a party. Working together toward a common goal. Giving or winning awards. Shadow: Keeping your nose to the grindstone. Recognizing good work by demanding more work. Failing to share in a group celebration. Allowing sour grapes to poison your moment in the sun. Refusing to do your part. Story: We see a demonstration of the Main Character’s special gifts. Relationships. Have you been together for ten years? Celebrate. Have you been together ten days? Celebrate. Do something to recognize the contribution of both partners. Alone? Celebrate yourself. Work. Assign duties, delegate, and get out of the way. Allow others to contribute, even if their contributions aren’t exactly up to your personal standards. When projects end, thank everyone involved in a meaningful way. Spirituality. It’s easy to allow any ritual to become empty. Get back in touch with what your rituals were meant to teach or inspire. When you restore meaning to your spiritual practice, every prayer becomes a celebration. Personal Growth. You can amplify individual achievements by becoming part of a group. Without decreasing the importance of your own contribution, you’ll achieve more…and have more to celebrate, too. Fortune Telling. Someone is watching and evaluating your work. You may get a wedding invitation soon. When? Between April 11th and April 20th. The Arbor. 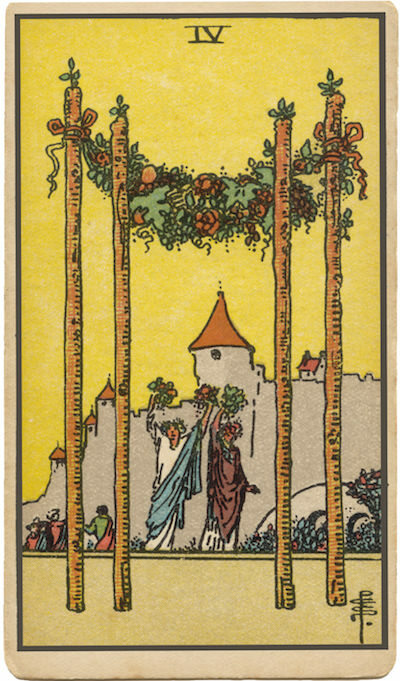 Most RWS-inspired illustrations for this card incorporate a celebratory arbor. What do you have to celebrate? Laurels and Grapes. Some RWS-inspired decks feature figures wearing laurel leaves and carrying bunches of flowers or grapes. Laurel leaves have long been given as tokens of recognition. Grapes suggest both harvest and celebration. Might it be time for a ceremony recognizing contributions? Shared Labor, Shared Rewards. To what extent is everyone in your group doing his or her part in your “harvest?” How might a celebration (or being reminded of what’s worth celebrating) better integrate the people working with you? The Marseilles Image. Four Wands have been woven together, creating a sturdy arrangement that might well serve as the top of a simple arbor. How might a celebration better integrate the people in your circle? To what extent am I doing my part? What kind of recognition would be most meaningful? How might a celebration now impact community morale?